Summary: All save the most stubborn of cynics should find plenty to enjoy here. Mambo Italiano had me laughing out loud. Even the stereotyping was endearing rather than irritating. Witty and fresh it differed from other rom com feelgood traditional-family-meets-modern living dramas. Perhaps the difference was this film didn’t over-fripperise its serious side, as do so many films in their attempts not to put the audience off. More than simply 2004’s Big Fat Greek Wedding, this Montreal based comedy updates Moonstruck, the 1987 Italio-American rom com starring Cher and Nicholas Cage, for the 2000s. Mambo Italiano is based on the hit play of the same name by Steve Galluccio, who was inspired by his own experience of growing up in Canada. The film delves into the difficulties faced by young gay Italio-Canadians up against a wall of tradition, an abstract yet forceful entity portrayed by director / co-screenwriter Emile Goudreault as a mixture of familial duty – and fear of what the neighbours might think. The film highlights the fact it is not only older generations whose lives are governed by rules imposed by their society. Young policeman Nino shuns his lover Angelo to opt for traditional family life, after his patrol partner hints at the scandal that would otherwise ensue. In doing so he demonstrates a clear preference of respectability above passion. Topics such as bullying, alienation in the workplace and depression are also bravely touched upon. In the words of Mary Walsh, who plays manipulative mother Lina: “Mambo Italiano treads a fine line between comedy and real life. It isn’t just a comedy.” That’s not to say the comedy isn’t there – it is and there’s plenty of it! In a twist typical the film’s originality Angelo’s sister, hoping to find him a new boyfriend, takes him not to a crowded bar to drown his sorrows in tequila but instead to a Gay Helpline volunteers’ meeting. 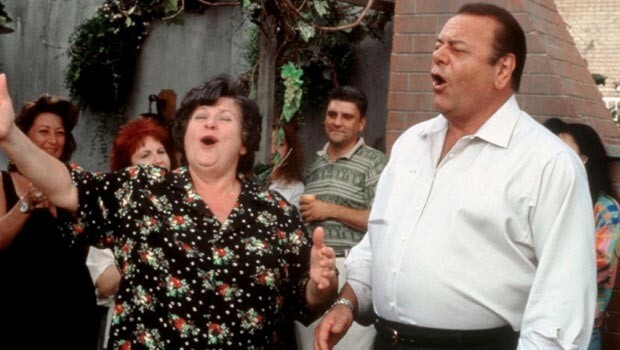 Antonio’s mother Ginette Reno gives a superbly hilarious performance as the put upon Italian housewife who has given her all, and for what? To be able to walk tall as she visits her allotment – is that so much to ask? As the narrative develops she realises it’s up to her to do the right thing, and garners a truer respect from the community for her show of courage. His father is played by Paul Sorvino of Goodfellas fame. Although all turns out fine in the end, the ending is not typical and it even finds time for self-reflective comment on the fickle nature of the movie industry. With scenes such as a family reunion in a confession box Mambo Italiano is certainly a gem. It’s funny, charming and very good. All save the most stubborn of cynics should find plenty to enjoy here – Goudreault may well be a name to watch out for.